The impressive model VSBX-385LED is a 16-by-6-foot scoreboard featuring 20-inch super-bright 100,000-hour-rated LED displays. The 18-gauge galvenneal steel cabinet with powder-coat finish is the strongest cabinet and best finish in the industry. 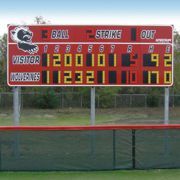 Varsity Scoreboards guarantees the lowest prices in the industry—they will beat any competitor's price, guaranteed. Varsity also has quick delivery with shipping time on most items within seven to 10 days—certain in-stock items may ship the same day. Varsity also provides 24x7 factory technical support. When a baseball diamond becomes a football field, a soccer field or a lacrosse field, these environments call for a scoreboard that can do it all. With Fair-Play's versatile line of multipurpose scoreboards, you make the call—just by changing the captions. Now Fair-Play introduces the newly reconfigured MP-8114-2 multipurpose scoreboard. This 14-foot-wide model provides scoring and timing solutions for a number of applications. Make scoreboards an essential part of your multi-sport playing field. For style, performance and innovation, believe in Fair-Play. BOARDWARE Software turns your IBM-compatible computer into an alphanumeric scoreboard that can be projected onto your pool wall. Driven by IST's MEETWARE, TIMEWARE, POLOWARE or WORKWARE, BOARDWARE gives you an easy-to-read display with 32 characters per lane line and a scrolling header line. BOARDWARE is recommended for pools with minimal or no natural light. It requires a computer with Windows 98 or better, a projector with sufficient lumen rating to show a bright image at the desired location and a theater-style screen surface for the best display. Step into the big leagues with a Spectrum Scoreboard. Both durable and dent-resistant, the scoreboards withstand the toughest conditions. This 7-foot-high by 20-foot-wide custom-designed baseball/softball scoreboard features a dynamic two-color mascot with inning-by-inning scores and runs, hits and errors. Team name, customized color combinations and border striping is always included at no additional charge. Prepare now for Fall sports with a new football scoring system from Nevco. Nevco's complete line of football scoreboards ranges from football-only models to multi-sport (football/track, football/soccer). Complete your system with message centers and team/sponsor signs. Your Nevco sales rep can assist you in designing a customized solution for your facility. Customers also can design their own system online. Stoughton Recreation Department purchased an All American Scoreboards MP-7353 LED scoreboard for baseball. This scoreboard provides all pertinent baseball information with the advantage of being able to time games. This multipurpose scoreboard is versatile enough to be used for other sports requiring a timer. The MP-7353 uses the latest in LED lighting. LEDs provide a wider viewing angle, are more vibrant, use less energy and are rated to last more than 100,000 hours. All American Scoreboards has been producing scoreboards for over 60 years. OES scoreboards are installed worldwide for a variety of sports activities, in a number of venues and custom applications, from local schools and sporting clubs to Olympic facilities and NBA venues. OES's proven technology is now used by NHL and NFL teams. From Locker Room Clocks to Shot Clocks to Complete Timing and Scoring Systems, OES design engineers are able to configure scoreboards and timing systems to suit customers' exact requirements. All OES scoreboards feature high-intensity LED digit displays that offer an exceptional viewing angle. OES has been advancing scoreboard technology to deliver the most innovative designs to the marketplace. Daktronics is an industry leader in scoreboards, displays, video and sound. In Duluth, Ga., you'll find just one example of what Daktronics can do. This board at Northview High School's stadium can show instant replays, live video, animations and sponsor information on the video board. Fans can also enjoy the important sounds of the game with the Sportsound system. The LED display makes it possible for everyone to stay on top of the score because it is bright, day and night. Expect superior customer service nearby to make sure the scoreboard is working season after season.